We've all answered the question on social media quizzes and during those awkward "icebreaker" conversations. You know the one: "If you could have dinner with any person in the world, past or present, who would you choose?" My answer would be, without hesitation, Bob Goff. Move over Dos Equis man, there's a new most interesting man in the world. Love Does is filled with incredible stories. Underdogs succeed, the guy gets the girl, dream adventures are turned into reality. Disneyland becomes a corner office, world leaders come over for a sleepover, and jail doors are ripped from their hinges. And the best part? 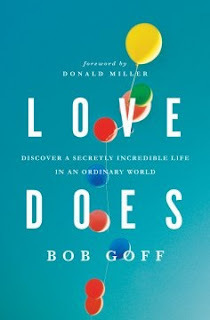 Bob regales us with one crazy real life tale after another, showing by example what it says on the cover: Love Does. Never have I felt someone's heart, joy, and passion come through so clearly on a written page. With each chapter I felt myself becoming more and more inspired (and downright pumped) to go out and live my life with the same zeal and positive attitude that Bob does. This isn't a book filled with 14 steps to a better you, or a list of bullet points to check off on your road to success. What Bob gives us is a book filled with his own experiences and observations on what it means to love, and how living hand-in-hand with love and whimsy can lead to a secretly incredible life. "I used to think knowing God was like going on a business trip with Him, but now I know He's inviting me on an adventure instead." It's these personal lessons from Bob's life, and the paths he took to get there, that make this book so amazing. There's a reason Love Does is a NYT Bestseller--it has the potential to be life changing if you'll let it. My review can be easily summed up in this recommendation: Put this on your must read list--your life will be better for having read it. I know mine is.